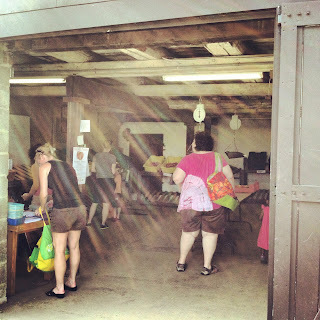 This is a guest post from Bradd's sister Julie on joining a CSA. It's part of our new series on Community Supported Agriculture (CSA) in partnership with Greener Partners at Hillside Farm in Media. Joining a CSA program would seem like a no brainer to someone trying very hard to buy only local, green and organic. However, as mentioned in Bradd's intro post for this series, many of us, myself included, are a bit intimidated by the idea of signing up, paying a lump fee, and learning how to use everything without a lot of waste. I always had visions of missing my pick up day or having only bok choy and eggplant – two things I am terrible at making – as my selections. Needless to say, I have been a slave to the grocery store and farmer’s market to find local and fresh produce. Until now….and probably never again. In less than two weeks, trying out a CSA has opened up a whole new way of produce shopping for me. I hope with the answers to a few important questions it will for you as well. What follows is my first-hand experience with some common CSA starter questions (or at least ones I've had). How do you sign up for a CSA? Easy. 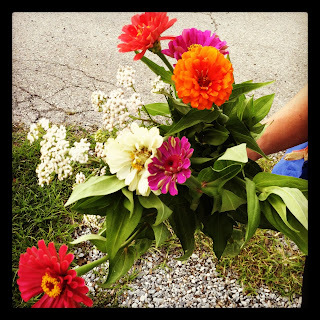 You search online for the closest farm offering a CSA to the community. This can be done very easily at a site like Local Harvest. Almost all have an online application with directions to mail payment or bring it to first scheduled pick up. For example, the Hillside Farm application explains that you have an option of two days for pick up that last about 6 hours. 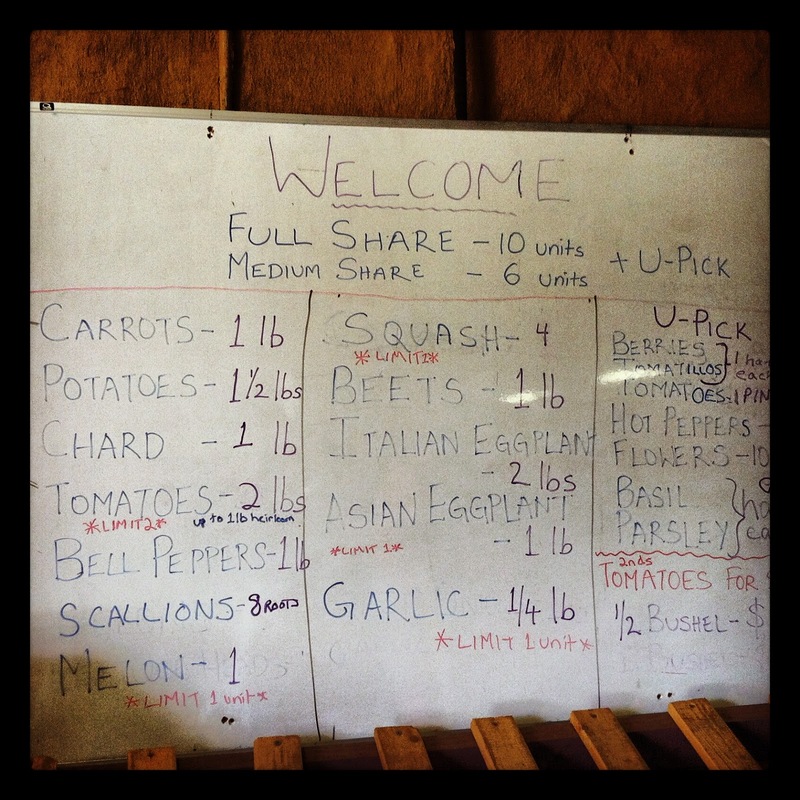 You can also choose between a full share or a medium (sometimes called half) share depending on the size of your family or how many meals you prepare during a week. What if I am concerned about the price? The thought crossed my mind, too. One alternative is to check out Community Supported Shares (CSS) where, based on income, you get a reduction! Want the garden experience? Check out a Work Share where you pay less yet have to pull your weight by working for it on the farm. These spots are limited and you need approval by the farmer. If you have extra cash on hand and are feeling generous, you can also become a Super Member by voluntarily paying more to help out the CSA program. What happens at my pick up? You shop and you pick! At Hillside, first you enter a small marketplace brimming with produce. Find your name on a list and initial the day you picked up. Next, check out the ‘Shareboard’ and, according to the size share you paid for, you can select from the units available that day. I have a medium share and am able to select 6 units. It’s important to check how much is in a unit: it could be one eggplant or a ½ pound of peppers or 8 scallion roots. The count can be different per unit and between weeks of the same unit – this depends on the harvest and the changing seasons. Staff members are always around to answer questions about the shareboard. 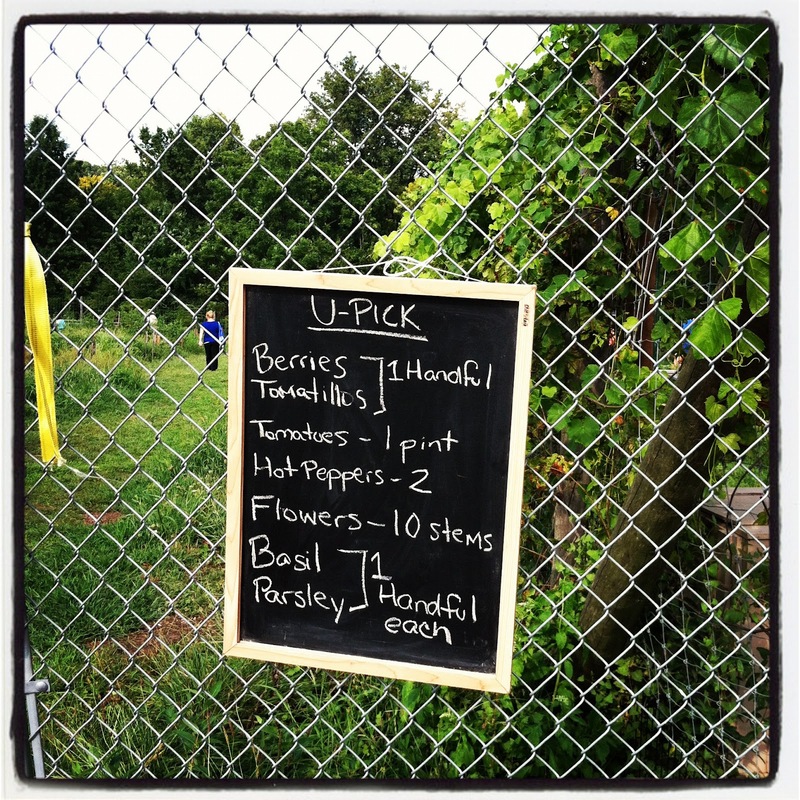 Once you weigh or count your units, give a friendly thank you to the staff and move on to the fun part, the U-pick! 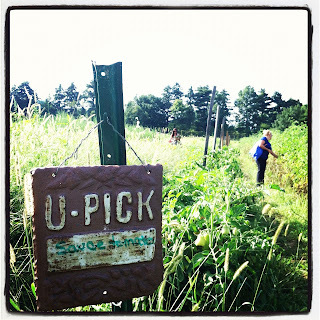 The U-pick works the same as the market and is based on a designated volume, except you get to walk up and down the garden rows and pick right off the plant. **Tip** Want to look like you have been using the market forever? Bring extra, smaller reusable bags to separate your shares out and then place them in your bigger reusable bag. How should you think about picking your items? My best advice is to think just like you would at the grocery store. 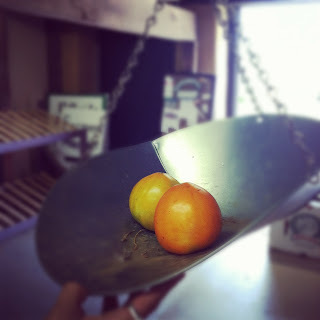 It's been enlightening to find out the CSA will have all the seasonal produce staples you find at the store – tomatoes, peppers, potatoes, onions, garlic. It’s not all bok choy and kale. Personally, I like to create a weekly menu every Sunday before I grocery shop to be efficient. Of course, sometimes I'll spot something off the list that looks particularly good and buy it – this happens at the CSA market as well. One difference between the CSA and the grocery store is that you’ve already paid for your share so you feel pressure to fulfill it 100% every time. Sometimes this can lead to a surprise purchase, especially when the harvest is good and your unit size goes up. It leaves more room to choose additional items on the smaller side that are unique. At a recent pick up, my fun, unplanned purchase was a melon. **Tip** Going to miss a week due to vacation or illness? That’s ok, most CSAs will let anyone come and pick up your share in your place. You can even split the share between parties or take turns each week picking up the share – but that does not mean taking double. You sure do. However, not all farms offer this and those that do will often fluctuate in how much and what you can pick based on the harvest and needs of the farm. 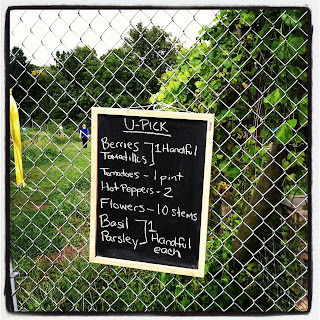 Most of the U-pick items are berries or from the tomato family. I went right to the flowers this time. Many of the U-pick items require you to cut off the fruit/produce so remember to look for the farm's clippers or bring your own. You also don’t want to come right from work or without sneakers since you will get dirty. Overall, it's a fun way way to get the garden experience. It has been educational for me to see that Community Supported Agriculture is really set up to benefit the farmer and the community. It sustains the farm through all types of harvests, gives them an early cash flow, and helps the community get fresh, staple produce with more vitamins and gives us an introduction to new varieties of food. 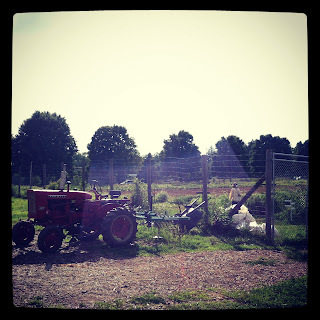 It’s also a GREAT educational tool for children and adults on how a farm works and a garden grows. Please let me know in the comments if you have additional questions and I'll get answers! I'm excited to share my experience with all of you. Here are some additional photos from our first visit... all the photos in this post were all taken with Instagram by my friend and fellow home cook, Rebecca (Rmr2d). YES! 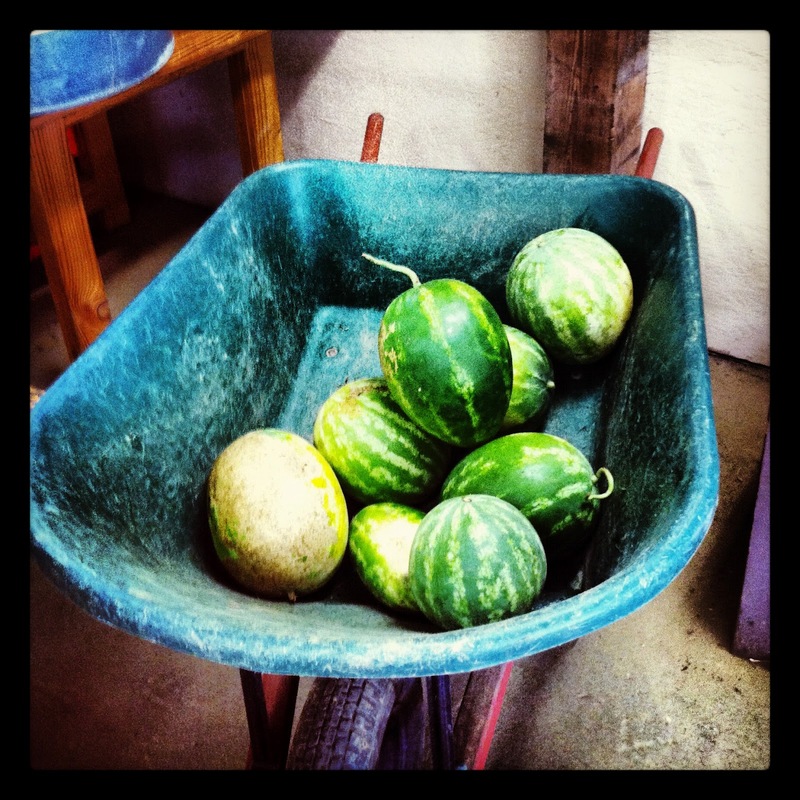 I have much love for CSA's, and I think Philly really has a number of wonderful options. We're members of Lancaster Farm Fresh, and it's such a delight to get a big box of the freshest, most delicious local produce every week. Totally inspirational for me. This year we also got an egg share, which has been super cool as well. I can't say enough wonderful things about my CSA-- I recommend to everyone!